Genießen Sie eine Blockhütte, die alles andere als Rustikal ist! 10 Personen, 4 Schlafzimmer. König Master-Suite, 2 Queen-Schlafzimmer und 2 Etagenbetten. Wir haben 3 Badezimmer alle mit zwei Waschbecken! Macht sich bereit schnell und einfach. Ein Spielzimmer, wo Sie Teams für Shuffle-Board und Fußball machen kann. Große große Zimmer mit Kamin und viele gemütliche Sitzgelegenheiten, Essbereich und eine voll ausgestattete Küche. Ein großer Baum gesäumten Grundstück mit einer Einfahrt ideal für Pferdeschlittenfahrten! Awesome spot and great place to stay! Frank was awesome, his place was great. Clean and he was a great host. Awesome location to the best mountains in VT. We were 4 adults and 6 kids and there was plenty of room for us. Great to have 3.5 baths as well. Nice but not kept up. We stayed for a long weekend in February at this property. We loved the cabin look and rustic feel of the house but were disappointed in how unkept it was. There were areas in the house that were not cleaned very well. We wiped down and vacuumed up what we could but in the extra pullout upstairs we were unable to vacuum the droppings. There was also small issues that included loose door handles and a wobbly toilet. We fixed what we could instead of calling the handyman and we did email the owner to let him know. And as just a heads up, we noticed that the kitchen/bed/bath supplies were very scattered & scarce. We searched all cabinets and closets to find what we could use. But there was barely any starter soap, no dish/hand towels, an old dirty sponge, few cooking pots and the spices looked to be expired. The owner emailed me back and said he was going to talk to his cleaning people and handyman and hopefully they will fix the issues. Close to stratton, very comfortable. Our family of 9 had plenty of sleeping space, bathrooms, and seating in the living area. The cabin is warm and cozy. We enjoyed the picnic table style dining and space to play board games. The big island in the kitchen was a plus. We did not realize there was no shower in the lower level bathroom. There were no towels in the main level bathroom used by 6 of the 9 people in our family. We hunted and found clean ones in the laundry room. The driveway is a challenge as was mentioned in another review. Two of our vehicles had 4WD, but our Toyota Sienna did not. We had significant snowfall the morning we left and some difficulty managing the steep and curving driveway. It takes more like 20 minutes to reach the parking lot at Stratton Mountain. The caretaker was responsive and helpful with any problems or questions we had. The weather couldn't have been more perfect and the skiing and tubing at Stratton were outstanding. Thanks for a wonderful winter get away for our family!! sorry you missed the normal size Shower in the downstairs bathroom, and yes plenty of towels in the wash room next to that Bathroom so yes there are 3 bathrooms all with tubs and showers. Sorry you didn't pull back the shower curtain LOL ! glad you had a nice stay ! Our group had a nice long weekend here. 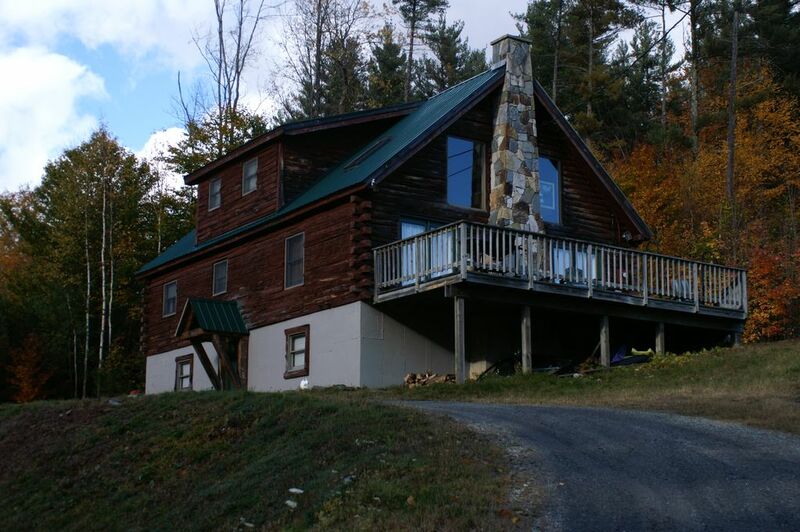 Roomy place, great cabin ambiance, a short drive to Stratton. Awesome fireplace with wood provided and a big outdoor deck were fun luxuries. The kitchen was well stocked. There was an extra full sized bed upstairs we weren't expecting, I believe it is a converted pull-out couch. So you could really sleep 12 here in a pinch. The bottom halves of the bunk beds didn't have much head room, so having that extra bed was nice. The driveway was a little steep/icy - not terrible, but 4wd is helpful. The owner was very relaxed and a pleasure to work with, and returned the damage deposit in a timely manner.